We have integrated a new option to force serialized connects on a per Zope connection object basis. This can be used to work around bugs in ODBC drivers which are not fully thread-safe in the connect phase. The option is disabled per default. ODBC driver compatibility updated. Upgraded to the latest mxODBC 3.3.5 release, adding compatibility enhancements for MS SQL Server. See the mxODBC 3.3.5 release announcements for full details. Enabled creating wheels from the prebuilt archives, which helps when running pip with the wheels package installed. pip then tries to build wheels during installation and caches them for future reuse. ODBC driver compatibility updated. Upgraded to the latest mxODBC 3.3.2 release, adding compatibility enhancements for MS SQL Server, SAP Sybase ASE and stored procedure output parameters. See the mxODBC 3.3.0 and 3.3.2 release announcements for full details. Compatible with Plone 4.0 - 4.3. Compatible with upcoming Plone 5.0. Added documentation on how to use External Methods to access and use the mxODBC Zope DA connection objects. Added support for input, output and input/output parameters to the .callproc() method for calling stored procedures. Added documentation on how to call stored procedures from Plone / Zope. ThreadLock egg distribution provided by eGenix to avoid having a compiler installed for the installation buildout run. Please see our ThreadLock distribution release announcement for details. Access all new features from the updated mxODBC 3.3 API via the DatabaseConnect.connection attribute or by importing the mxODBC API directly. Please see the mxODBC 3.3.0 and 3.3.1 release announcements for full details. ODBC driver compatibility updated. By upgrading to the latest mxODBC 3.3 release, we are bringing all compatibility enhancements added to mxODBC 3.3 to the mxODBC Zope DA. This includes updated support for Oracle, MS SQL Server, Sybase ASE, IBM DB2, PostgreSQL and MySQL. See the mxODBC 3.3.0 and 3.3.1 release announcements for full details. ODBC manager compatibility updated. Built against unixODBC 2.3.2, iODBC 3.52.8, DataDirect 7.1.2 on Unix. Built against the MS Windows Manager ODBC on Windows. Built against iODBC 3.52.8 on Mac OS X. Added a work-around for a regression in Python 2.7.4 that results in a segfault when exiting Zope/Plone after loading the mxODBC Zope DA. The regression will be fixed in Python 2.7.5, but we don't want to expose our users to segfaults, so added a work-around. Upgraded the underlying mxODBC library to version 3.2.3. See the mxODBC 3.2.3 release announcement for additional details. Added a new connection property "ODBC cursor type" which allows easily adjusting the ODBC cursor type to be used for mxODBC Zope DA connection objects. This new property allows enhancing the performance of the adapter significantly, when using it with MS SQL Server or IBM DB2 database backends. Please see below for details. MS SQL Server performance can now be much enhanced, and increased to levels beyond that of previous mxODBC Zope DA releases, by adjusting the connection ODBC cursor type to "Forward only cursors". The performance increase compared to mxODBC Zope DA 2.1.0 is enormous: from 2-3x faster executes/fetches for average queries, up to 300x faster for simple cases. In mxODBC Zope DA 2.2, we will switch to using "Forward only cursors" per default for all database backends. IBM DB2 can benefit from the same performance enhancements using "Forward only cursors". The effect is a lot smaller, but still noticeable: up to 2x faster executes/fetches with forward-only cursors, compared to mxODBC Zope DA 2.1.0. Added documentation to explain the different cursor types, compatibility with different database backends and effects on performance. The Zope DA documentation comes with high level documentation regarding the cursor types. The included mxODBC documentation has the technical details. Fixed the installation instructions to be more generic and easily adaptable to Plone and Zope installations on both Windows and Unix platforms. Simplified zc.buildout deployment as used in Plone 4.x and the latest Zope 2.13 releases. Readded compatibility with all recent Plone versions. Please see the mxODBC 3.2 release announcement for a complete set of changes available in the underlying mxODBC 3.2 package used in mxODBC Zope/Plone DA 2.1. Error screens have been changed to plain text after the recent hot fix which disabled showing HTML in error messages. The "Security" tab now also works in Zope 2.13. Added instructions on how to install mxODBC Zope DA 2.0 with Plone 4.1 and Zope 2.13 - even though this combination is not officially supported by the mxODBC Zope DA 2.0 series. Backported the mxODBC Zope DA product to also run on Zope 2.10, 2.11 as well as Python 2.4. This was done to meet popular demand, since Plone 3 still uses these Zope and Python versions. 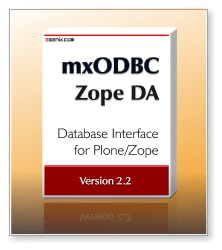 The mxODBC Zope DA is now fully compatible with all recent Plone versions, including the upcoming Plone 4.0 release. Includes mxODBC 3.1 with updated support for many current ODBC drivers, giving you more portability and features for a wider range of database backends. Mac OS X 10.6 (Snow Leopard) support. Python 2.5 and 2.6 support. Zero maintenance support to automatically reconnect the Zope connection after a network or database problem. Automatic and transparent text encoding and decoding. New decimal support to have the Zope DA return decimal column values using Python's decimal objects. Fully eggified to simplify easy_install and zc.buildout based installation. (c) Copyright 2000-2013 eGenix.com Software, Skills and Services GmbH, Langenfeld, Germany. All Rights Reserved.